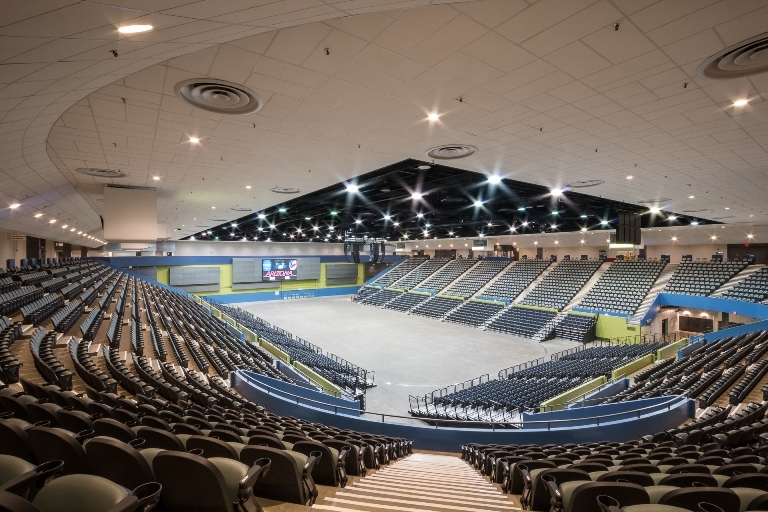 Swaim Associates teamed with the Rio Nuevo District and the City of Tucson to renovate the TCC Arena. The focus for the 9400 seat, 180,000 square foot facility was to improve the fan experience by replacing the seats, sound system, lighting, signage and ceilings, and renovating the restrooms and concessions. The score boards were replaced with large high definition video boards, and flat screen monitors were installed throughout the arena. The underutilized breezeway was transformed into an indoor/outdoor lobby and reception hall, and the escalator lobby was enhanced by the Tucson Musicians Museum exhibits. Design standards were established for the entire TCC to unify the center and direct future upgrades. Energy and water conservation rebates achieved for lighting and toilet upgrades were returned to the project for additional funding. The TCC Arena Renovation received the 2015 Arizona Public Works Project of the Year award. This entry was posted on April 2, 2015 by swaim_admin.